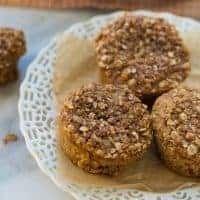 Perfect apple crumb muffins with a moist, tender crumb, crispy streusel topping and shredded sweet apple, in every bite! Preheat the oven to 350F. Line a standard muffin pan with paper liners. Combine all the ingredients for the crumb topping with a fork until pea-sized lumps form. Combine all the dry ingredients in one bowl and the wet in another bowl. Add the wet ingredients to the dry, along with the shredded apples and stir until just barely combined. Don’t overstir! Scoop the batter to fill each muffin cup 2/3 of the way. Sprinkle each with some of the crumb topping, pressing lightly. Bake for 20 minutes, until a toothpick inserted into the center comes out clean. Cool slightly and enjoy! *Thinly sliced almonds or quinoa flakes can be substituted for oats.